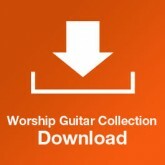 Each individual lesson teaches you a well known worship song. Even if you know how to play the song already you'll pick up a host of new tips and ideas in these lessons from Musicademy's Andy Chamberlain. The lessons are each between 25 and 45 minutes long. This lesson explores strumming patterns that work over the changing time signatures that this song brings plus you’ll learn some usable one finger chord changes in the key of G.
In this lesson you’ll not only learn a great set of cheat chords in the of E, including a brilliant cheat for E/G# but also a set of ‘one finger change’ cheat shapes based around C that with a capo sound perfect for delicate songs in the key of E.
This lesson combines learning a great strumming pattern for syncopated songs alongside another usable set of cheat chords in the of E, include a cheat for E/G#. In this lesson you’ll learn some alternative one finger chord changes in the key of G alongside a capo that move smoothly from one shape to the next including Cmaj7. This lesson combines approaching songs in 6/8 time signature with strumming patterns that split up playing the treble and bass strings to give a more percussive sound. 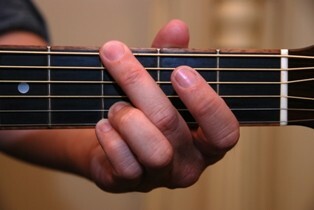 You’ll also learn some more one finger chord changes in the key of G alongside a capo. This monster of a lesson shows you how to approach playing hymns with quick chord changes on guitar, and because the song changes key for the final chorus you’ll learn these quick change chord shapes in both the C and D based shapes. Not for beginning guitarists! This lesson combines learning chord shapes with easy changes in the key of C including a great cheat for the F chord without having to play a barre chord, plus learning strumming patterns that change between verse and chorus. This lesson explores sets of chord shapes not only in the key of G but also a set of open chords that sound rich and full in the key of B without having to use a capo. Plus you’ll learn some strumming pattern ideas for for rocky driven songs. This lesson explores learning cheat chords in the key of D including a cheat for Bm without having to play a barre chord. Plus you’ll learn how to approach 8th note strumming patterns for using over fast songs. Set of new one finger chord changes in the key of E without having to move up and down the guitar neck including A/C# and B/D# plus strumming patterns for pushed syncopated songs. This lesson combines exploring some unusual cheat chords like G/F plus strumming patterns for fast songs that work over two bars and learning the song’s riff on acoustic. This lesson explores changing 8th and 16th note strumming and finger picking pattern options for songs with wide dynamics alongside move usable cheat chords in G.
In this lesson you’ll learn some one finger chord changes in the key of G alongside a capo that move smoothly from one shape to the next. This lesson explores using C based chord shapes for songs written in the key of D alongside some changing strumming patterns and learning the intro riff played on acoustic guitar, note for note. This lesson combines learning chord shapes in the key of C including a great cheat for the F chord without having to play a barre chord, with right hand strumming techniques including palm muting to add tension and release. This lesson explores using a set of alternative C based chord shapes for delicate songs in the key of E alongside learning a strumming pattern that splits up playing treble and bass strings to give more percussive sounds. This lesson explores using right hand damping techniques to create tension and release alongside some one finger change cheat chords in G. You'll also learn the song’s riff or motif note for note. In this lesson you’ll learn how to add up strums into a strumming pattern to create movement and dynamics plus some one finger chord changes in the key of G alongside a capo that move smoothly from one shape to the next. This lesson combines exploring some variations in the way simple chords are played to create lighter and darker sounds and varying strumming patterns to reflect a song's dynamics. This lesson shows you two ways to play this song using both E and C based chord shapes to give differing sounds and dynamics. A discounted bundle pack of chord charts are available for all these songs. Please just click to add them to your cart. Each of these lessons is exclusively available as a permanent video download. You can play it in any standard video playing software such as VLC (recommended), Windows Media Player, Real Player or Quicktime (do make sure you have the latest version of these installed if you run into any problems). And please remember to back up your files. 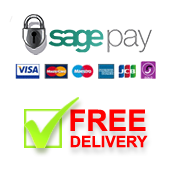 You will have 3 download attempts for each lesson purchased. Please be sure to download the links ONE AT A TIME. Each is a video file of about 500MB so will take some time to download. If you attempt to download several at a time you may well lose your download attempts. Why are these lessons not available on DVD? Unfortunately we ran into a problem with one of our cameras while recording these lessons which was not picked up until the edit stage. This has resulted in one of the 3 camera angles sometimes showing a slightly out-of-focus image. The learning is still the same but as the picture quality is sometimes not up to Musicademy's normal high standards we decided not to release this series to DVD. Rather than scrap the footage we've made it available as a download-only product. You can watch the sample video for an idea of the quality of the content. This is a fantastic product, aimed at helping people improve their worship guitar playing via lessons based on popular songs. What sets it apart are the 'tricks' and suggestions of how to play each song (and by implication others like it) better. For example they show you how to use quite open chords in the key of C (with a capo) to play reflective songs that are in E - a different set of voicings that really suit that type of song. Other books/teachers could give you the same information, but this DVD shows you in the context of worship songs. Basing lessons around songs makes the whole thing interesting and enjoyable, and the number of songs makes this great value for money. Highly recommended!